Today I would like to show you some looks from the Blumarine fashion show during Milan Fashion Week. I actually had not a really big interest in this Italian fashion house before but then I found their runway photos from their last show…. Wow! I am in love hihi. The designs look gorgeous, I love the silhouettes the colors Blumarine used for their new collection, the fabrics, it looks well cut. To me it just looks perfect. What I also love is that every design accentuates the female curves very well and the items have a really delicate and feminine feel. Besided that most of the designs are super wearable as well, how awesome is that! 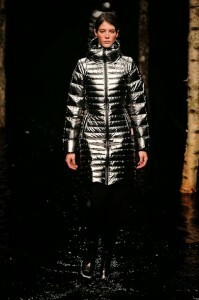 When getting inspiration and looking at the fashionshows from London Fashion Week I saw this gorgeous rain clothing. 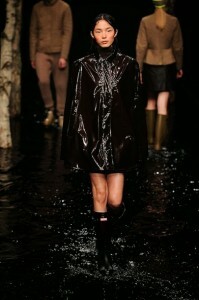 The brand Hunter, known from the cool and fierce rainboots, showed their new fall winter collection. 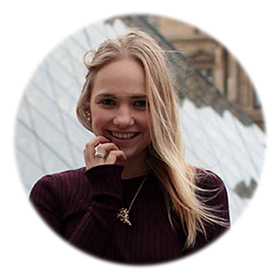 According to the fashion branche Hunter is starting to be more than just a rainboots brand but is actually more of a fashion house. From what I have seen so far, I definitely agree! Not only the boots are looking gorgeous but also the raincoats look just fabulous! I used to always hate rainclothing, looking like someone working on the garbage truck, not something I like. But now, this I would wear, for sure! What do you think of this gorgeous collection? It’s kinda HOT right?